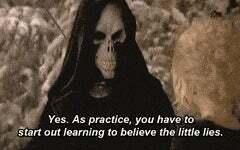 GIF: A little Pratchett to lighten the mood. He’s also really bad at his job, which makes it harder for me to be good at mine, so I’m pretty stoked at the possibility of adding to the list of functional coworkers. They’re letting him finish out the semester and letting him tell whatever story he wants to the students and future employers (which is STUPID, but I digress). He is coming to work ... about a 1/3 of the time. I don’t necessarily think that’s a great way to get another job, but again: poor judgment. Today he showed up for a faculty meeting where we were supposed to discuss the search for his replacement. He was looking a little more out-of-it than usual and entered the room without making eye contact, then sort-of shuffled to a seat near the door. I tend to have anxiety flare-ups in the spring, so I’m a little on edge anyway, but something about the way he did it had me (briefly) convinced he was going to pull a gun before the end of the meeting and we’d all be on the evening news. He obviously didn’t, and I obviously shared my concern with our boss (who isn’t going to do anything). The boss thinks I’m being paranoid. I hope he’s right, and I don’t want to pursue it further, but it does leave a certain morbid awareness of life’s fragility hanging over your Tuesday. ... how’s your Tuesday? I’m having ice cream for dinner.